How do I use Elite Ops Energy Strips? Pull apart the foil package from the top, peel the strip off the foil and then place the strip on your tongue and press the strip to the roof of your mouth. As the strip dissolves the active ingredients are absorbed under your tongue directly into your bloodstream. This makes Elite Ops Energy Strips faster acting than energy products that travel through your digestive tract before being absorbed. 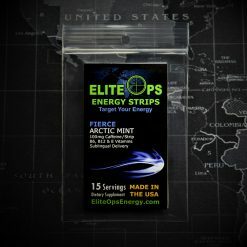 Can I combine Elite Ops Energy Strips with other energy products? Yes. Remember to keep track of your total caffeine intake. It is generally not recommended to exceed 200mg in a 3 hour period or 400mg per day. However, you need to know your body’s limits and stay within them. 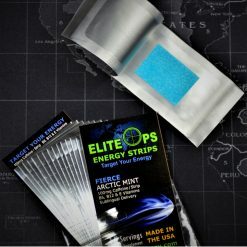 Are Elite Ops Energy Strips waterproof? Yes. The foil packaging forms an air and water tight seal around each individual serving so they travel with you rain or shine. We ship via USPS and shipping is calculated at checkout. All major credit and debit cards as well as PayPal. Typically delivery takes 3-5 business days.